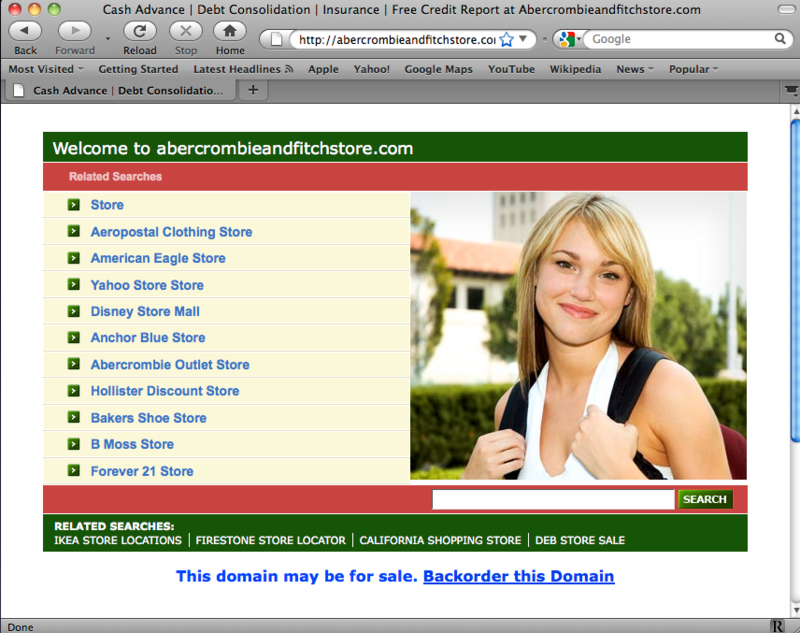 Lets say you go to the website “abercrombieandfitchstore.com.” What would you expect to find there? Probably not what you see below. That’s cybersquatting, and it is illegal. Abercrombie & Fitch have had enough, and they’ve brought suit against the as yet unidentified owners of more than 150 infringing domain names. Most of them are Pay Per Click sites, and it is pretty clear that the plaintiff should prevail. As many readers might know, when a plaintiff takes aim at a cybersquatter, there are two avenues of attack — bring suit in federal court (which is generally more expensive) or file a nice, quick, and cheap UDRP complaint. In this case, Abercrombie opted for the former, but this seems to be a tactically (and financially) sound decision. Under the UDRP, you need to pay filing fees according to how many domain names you are going after, and the complaint can only be against a single cybersquatter. In this case, there may be dozens of defendants. Even if there happened to be only a single defendant, the UDRP filing fees would likely be in the range of $20,000, given the sheer number of domain names. Despite the fact that most of the domain names are clearly infringing, there are some puzzling additions. In addition to the clearly infringing “bercrombie.com,” and “wwwhollister.com,” the complaint says that “ant.com,” “asnf.com,” “hcos.org,” and “fierce.org” are also in violation of Abercrombie’s famous trademarks. I’m just not seeing the infringement there. While some go to pay per click pages (yuck) and others are dead links, ant.com seems to be a search engine. Which makes you wonder, why would such great attorneys make such a seeming blunder? I suspect that Abercrombie’s lawyers know that these non-infringing domain names are owned by the same people who own some of the clearly infringing domains. Cybersquatters usually default in these cases, leaving the plaintiff with little financial satisfaction for all of its trouble. Ant.com is worth somewhere in the neighborhood of $300,000 or more. With that kind of domain at stake, someone is certain to come forward rather than risk losing that kind of online property in a default. I have mixed feelings about that kind of tactic. On one hand, I have serious misgivings about a clearly non-infringing domain name being added into a complaint. Abercrombie & Fitch was going about its business, selling clothes modeled by white people and beloved by Asians. Then, some unscrupulous cybersquatters started infringing on A&F’s intellectual property rights. A&F then had to hire expensive lawyers to clean up the problem. I believe that the cybersquatters should, at least, pay A&F’s attorneys fees. But, if they are hiding and simply default, then A&F will be out a serious chunk of money, while the wrongdoers run off scot free, with their pay per click fees in their pockets. If A&F is trying hold something hostage in order to smoke them out, I respect that tactical decision. Ultimately, if the cybersquatters do default and they don’t pay the judgment, then A&F can likely foreclose on their entire domain portfolio. If the only thing of value in that portfolio is ant.com or some other non-infringing domain names, then A&F may have done well to at least lock the domain name down while the litigation is pending. Bias alert: I am proud to say that the lawyers for A&F are friends of mine. This entry was posted on Tuesday, December 14th, 2010 at 10:52 am and is filed under cybersquatting, trademark. You can follow any responses to this entry through the RSS 2.0 feed. Both comments and pings are currently closed. ianal, so i wouldn’t know, but I’d hope this kind o blatant infringement could be resolved by a non-expensive lawyer, too. If you hire an inexpensive lawyer, you usually get what you pay for. And … as blatant as the problem may seem, solving it does require some pretty specialized knowledge — knowledge that costs money.